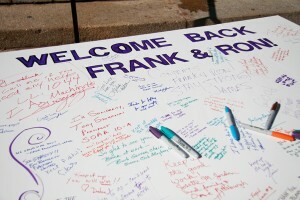 Welcome Back Frank And Ron! On Monday, nearly 200 people chanted and sang as we marched fired UPMC workers Frank Lavelle and Ron Oakes to Presbyterian Hospital for their first day back at work. Frank and Ron were fired after they started forming their union at our region’s largest employer. Join Frank, Ron and all the other UPMC workers standing up for middle-class jobs by asking your friends to sign on to our Code of Conduct for a Strong and Healthy Pittsburgh. Even after they lost their jobs, Frank and Ron did not back down. Together with their co-workers and the support of the community, workers took UPMC to Labor Board and won a historic settlement of over 80 alleged violations of workers’ rights. They showed us all that UPMC can be held accountable. While Frank and Ron are standing up for a stronger, healthier Pittsburgh inside UPMC, we’ve been all over Pittsburgh building a movement to make UPMC really act like a charity. Be part of the movement by sharing the Code of Conduct with your friends today. We’re standing together to make sure UPMC puts the strength and health of our community first by guaranteeing equal access to our community’s healthcare institutions, paying it’s fair share to support public services, respecting employees’ rights and supporting good middle class jobs for all working people and promoting the health of our whole community. Show your support for Frank and Ron and a Pittsburgh where we all share in the prosperity of our largest and wealthiest tax-exempt charity by telling others about the Code of Conduct for a Stronger, Healthier Pittsburgh.